Convert email to task in just few clicks. Convert email to task or appointment. 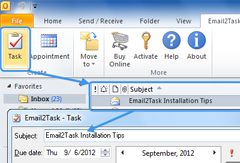 The Email2Task Menu is available on Outlook 2007 Menu Bar. Create a task from email quickly. Click “Create Task” button to create new task or you can edit the task first. Create an appointment from email quickly. Click “Create Appointment” button to create new appointment or you can edit the appointment first. Move your emails easily to default or any selected folder. What I really like is the ability convert my email messages to tasks in few clicks. I am very pleased with it. It was quick and easy to download and very easy to use."